How does dough extrusion work? Dough extrusion is a process in which dough material in bulk is forced to flow, under pressure and shear, through a shaped die (orifice) and then cut to obtain a single piece of product of desired form or dimensions. A hopper is placed over the feeding or dough driving mechanism. The hopper holds the dough load coming from the mixer and becomes a balance tank. Hoppers have a special conical configuration, using gravity to convey the dough downwards. Two or three rollers force the dough into a “pressure chamber” that is located just before the die. The rollers run continuously (at low rotation speed that can be locally adjusted) or intermittently to force dough out of the pressure chamber at the die. In other systems, a single- or twin-screw feeder is used for handling different product rheology and consistency. A die, nozzle or orifice, function as the final forming mechanism. Different diameters, shapes, configurations (e.g. concentric) and construction materials can be used, depending on the rheology and stickiness of the dough, product filling needs and desired form of the finished product. 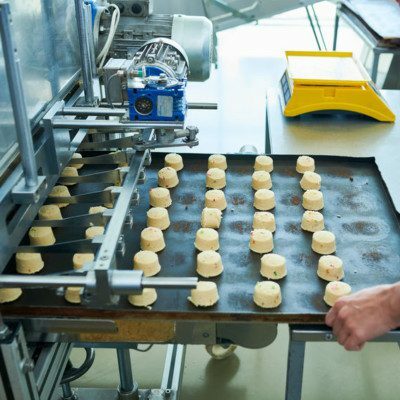 For production of wire-cut cookies, the dough is extruded, and a wire or blade mounted on a frame moves through the dough just below the die outlet. The cut dough pieces are then dropped onto a conveyor band for transport to the oven. The number of strokes ultimately determines the output (units per min) of this type of extrusion configuration. Another cutting configuration is known as “bar- or rout-press.” Unlike the wire-cut system, a continuous ribbon of dough is extruded through the die, usually concentric and connected to a second hopper containing filling to be injected inside the product. Then dough ribbon is cut into individual pieces by a vertically operating guillotine before the oven or after baking. If the product is to be baked as a continuous ribbon, the dough is extruded and deposited directly onto the oven band; otherwise, it is extruded, cut and deposited onto a conveyor belt connected to the oven. Dough extruders usually run at low speeds (hence generating low shear) to help the dough retain its integrity, prevent product distortion and to balance the speed of the oven (capacity). Dough extruders are rarely the production bottleneck of the line. The output of the extruder is usually limited by upstream equipment (mixer) and downstream equipment (oven). The formulation of the product is important when selecting the proper forming equipment. Dough extrusion is not suitable for doughs that are too soft or fluid so that they become pourable or have a cake batter-type rheology. The extruded product needs to hold on to its shape after passing through the die. Compared to other forming methods such as rotary moulding and sheeting, dough extrusion presents some challenges. Issues such as distortion of the extruded dough piece and inconsistent placement or drop (depositing) of the cut piece onto the conveyor can occur. Mechanisms to reduce product waste should be considered when selecting dough extrusion equipment. As some waste is generated due to process inconsistencies, the possibility to send incorrectly extruded dough back to the hopper should be considered. Cauvain, S.P. “Cookies, Biscuits and Crackers: Formulation, Processing and Characteristics.” Encyclopedia of Food Grains, 2nd edition, Volume 3: Grain-Based Products and their Processing, Academic Press, Elsevier Ltd., 2016, pp. 37–43. Riaz, M.N., and Rokey, G.J. “An Introduction to Food and Feed Extrusion and Associated Terminology.” Extrusion Problems Solved, Woodhead Publishing Limited, 2012, pp. 1–2. Manley, D. “Extruding and Depositing of Biscuit Dough.” Manley’s Technology of Biscuits, Crackers and Cookies, 4th edition, Woodhead Publishing Limited, 2011, pp. 467–475. Davidson, I. “Dough Piece Forming: Depositing.” Biscuit, Cookie and Cracker Production, 2nd edition, Academic Press, Elsevier Ltd., 2019, pp. 67–73.